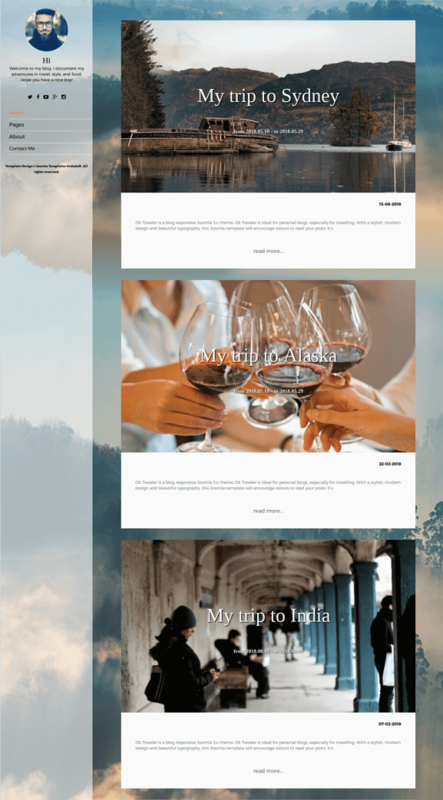 Traveler is a blog responsive Joomla 3.x theme. Traveler is ideal for personal blogs, especially for travelling. With a stylish, modern design and beautiful typography, this Joomla template will encourage visitors to read your posts. It’s fully responsive, providing a flawless experience on any device, from a desktop computer to a smartphone. With Traveler you can post pictures, videos and share them with friends. Quickstart package will help to install template in minutes. Google Location Map Module is included. Using modern Joomla blog template, you can create fresh layout and appearance for technological blogs and portals, calling some most fashionable terms in the field such as: responsive design, infinitive scrolling. This Joomla blog template is completely built on OS Content Construction Kit for Joomla. With it help you can build absolutely any content: blog, gallery, accordions, forms etc. We also provided custom pages (About me, My services, My history) and a gallery where you can add your photos and share them with your subscribers in social networks. Plenty of module positionsDue to Joomla Blank template, Traveler - Joomla Business Template comes with a wealth of module positions to place your content exactly where you want it. Cross-Browser CompatibilityTraveler Joomla template fully compatible with all browsers: Chrome, Firefox, Safari, Opera and Internet Explorer 9+.